Suppose your boss wants you to buy six 1/2 in x 450 in rolls of Scotch tape at the dollar store (remember the 6% Michigan sales tax). Your boss wants you to use the tape to enclose an area of 3,225.8 square cm, but has only given you a budget of $7.00 to do so, including the amount of gas to drive back and forth to the dollar store, which is exactly 1.5 miles away from work. Your car gets 0.0735 liters per kilometer city (you will not be taking the highway), gas is $4.09 per gallon, and your boss does not care about the gas that it takes to actually start your car. Do you have enough tape to enclose the area that your boss asked to have enclosed? If you do have enough tape, explain why. If you do not have enough tape, do you at least have enough money to buy another roll of tape? 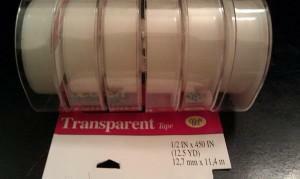 If you need to buy another roll of tape, but cannot afford to, how much short would you be? If this is the case, would it be worth it to pay the amount out of your own pocket, or would you rather call your boss and explain the situation? This entry was posted in Uncategorized and tagged Application, Gas Prices, Geometry, Measurement, Money, Scotch Tape, Tax on May 14, 2011 by Jon Oaks.